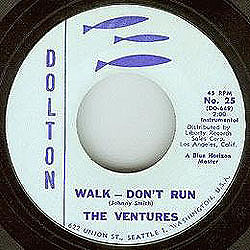 The Ventures’ ‘Walk, Don’t Run’ created a profound impression on the contemporary UK instrumental scene – even if much of its thunder was stolen by John Barry’s less animated, more measured homegrown version, not without merit but hardly in the same league. It was beyond question an inspired arrangement. Adapting the Chet Atkins model, Johnny Smith’s melody was made less fussy and more memorable. It was taken at a fair lick and kept straightforward and uncluttered with no vocal trimmings and no inarticulate whoops or other party noises which were in vogue on US instros at the time. 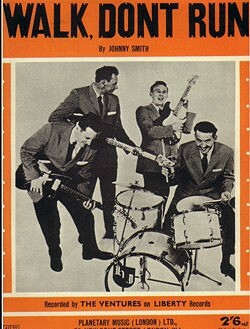 It has attracted a deluge of imitations and tributes, and has been re-recorded at intervals by The Ventures themselves in different styles, of which the earliest (‘WDR ’64’) was surely the most imaginative and certainly the most influential. Their latest studio re-recording, on the 1999 CD (Japan) V-Gold, with its plummy lead guitar and deliberate manner, is one of the least appealing examples. They have also committed to record numerous live performances of this perennial favourite, whether on its own or as a key component in their trademark electrifying medleys. 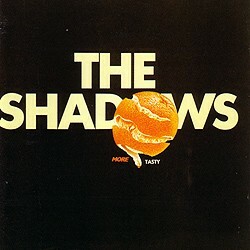 The Shadows, after flirting with the number in a derivative way on radio spots in the early 60s in acknowledgement of its excellence and popularity, eventually got round to issuing a distinctive studio version on Tasty, an album containing some of their finest work: with Brian Bennett in incandescent form, and with the Marvin Strat sounding particularly vibrant and full-bodied, they steamrollered their way through this stellar composition with tremendous dynamism and verve, taking it into their stage act, though only fleetingly. Given Magic Records’ close links with the music of The Shadows, their take on things constitutes a surprising and regrettable omission on the French company’s entertaining 2005 CD Walk Don’t Run Mania.